Life is finally calming down again after a very busy start to September. I was crushed to have missed last week's Granola Muffin, which got rave reviews from the Muffin Monday bakers, so I'm very happy to be back on the muffin-making horse this week with this simple, Jam-Filled Muffin. I then had a flashback to the French jams I used to enjoy while living in Germany - and for a very short time in France - and tried to track them down in Halifax. I'm not sure how these jams measure up to the French, but as far as store-bought preserves go, I adore them. In the end, I was successful in finding St. Dalfour's Natural Fig Royale Jam (the organic aisle at Superstore), but unsuccessful in finding Bonne Maman's Apricot Preserves. Must keep hunting: I found Bonne Maman in South Korea, so it has to be here somewhere. 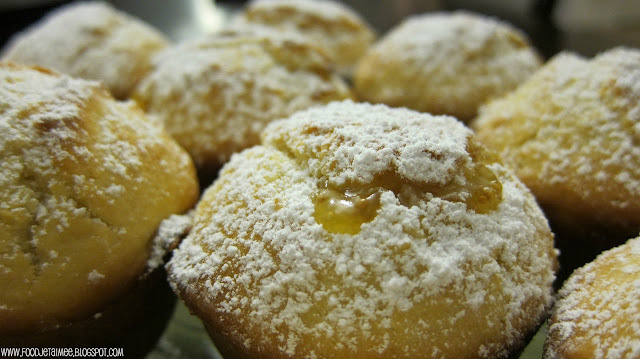 With the addition of lemon zest, these are the sweetest little breakfast muffins. Watch the timing on these, however: with only 18 minutes gone on the clock, they were golden brown and nearly overdone. A minute or two less and they might have been more moist. A friend mentioned that it could be due to the fact that I used organic cane sugar, which has a tendency to absorb moisture more quickly than regular sugar. This being the first time I've used cane sugar, it sounded like a valid theory to me! 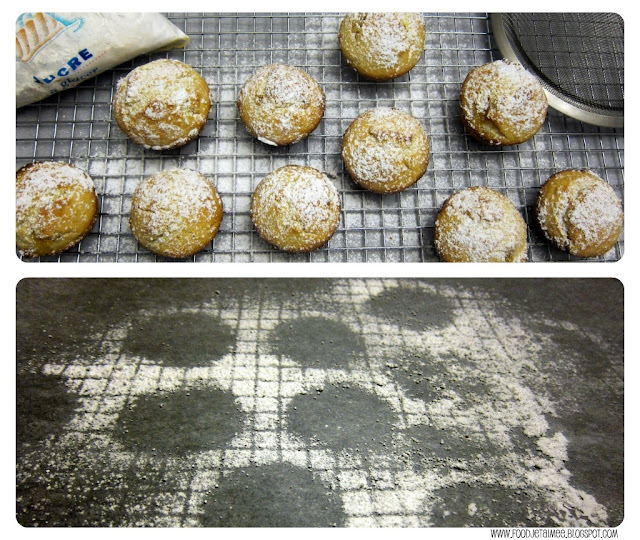 I then sprinkled them with a bit of icing sugar when they'd cooled a bit, because, well, that's just how I roll. Make sure you head on over to Baker Street to see what all the other bakers did with this jam-filled muffin! I'm more in awe of everyone's creativity and ingenuity with every week, no matter how simple the recipe. Also, Anuradha has put together a Muffin 101 guide that is an excellent read! Whether you're a beginner muffin-maker or an aficionado, head on over to read all sorts of interesting facts and great tips in muffin-making. Your muffin is tempting! I wonder though how fig jam taste like. I haven't seen one here in Manila. If I had to buy store-bought, St Dalfour would be my choice too and fig jam is a great choice of filling. That last shot of the sugar muffin silhouettes is precious! Never tried fig jam, assuming it tastes better than a fig newton!! Nice! Oh these are lovely dusted with powdered sugar. Perfect! How darling! 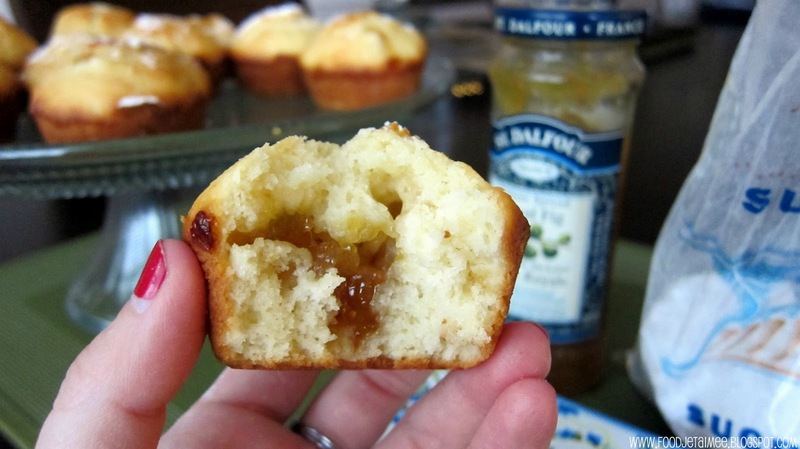 What a great combination for these Jam-Filled Muffins! WONDERFUL post ~ and GLORIOUS photos too......and I love the idea of fig jam! Thanks so much for mentioning me, I feel very honoured.....I love the addition of the lemon zest, such a great idea to add your muffins.....which look divine! man i wish i could make those now! great post and awesome tempting pics. Fig jam seems so interesting. I do not think I have ever come across this flavour in any super market. Lovely post, lovely space and beautiful pics. I feel SO LUCKY this week that I got to eat one of these lovely, enticing little guys. I can attest that they were DELIGHTFUL! Have a great time jam-making with your mom. Love your pics :) I don't think I've had fig jam before, must be delicious! another great muffin Monday post. Great choice on the fig jam! I bet that was great. Love the powdered sugar, sort of like jelly filled donut! :) Yum! Delicious! It's unbearable to look at...I can't resist! Glad to bake with you this week!